This coming Monday at 7pm, Greg Jarrell will be with us to play some jazz (A Riff of Love! ), and tell his fascinating, incomparable story. I say “incomparable” – but there are comparisons, people who’ve done what Greg has done, people like Dorothy Day, Clarence Jordan, St. Francis and Jesus himself. We tend to talk about and maybe even to Jesus from behind our closed doors and in our safe, familiar places – and we miss so very much. Greg will stretch your imagination and envision the possibilities. Church matters. Not that we do for others and fix their problems. Greg and his wife Helms have lived – by choice – for 13 years now in the Enderly Park neighborhood of Charlotte, an area others have fled, or dreamed of buying up and redeveloping, or avoided while out and about. Greg, after finishing seminary and hearing his call to ministry, came to Charlotte, not to do for others, but to be with them. Which is what Jesus did when he came to visit us all those years ago. And which is what church does when we really matter the most. 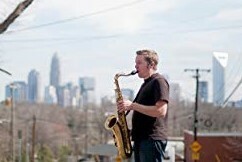 Greg is a pretty fair saxophonist, and in his new book, A Riff of Love, he narrates the life he’s experienced right here in Charlotte, and through the fascinating, artistic lens of jazz. The musician plays a “riff,” and the wonder is in variations on the theme. God’s love is like a simple tune, a memorable riff – and the beauty comes when we devise fresh, creative, beautiful ways to let it be heard, and seen. I’m not sure when Church became like “our club,” a place where we ponder spiritual things with people like us. I admire people who are like me… but it gets dull after a while, as it feels like an echo chamber. I am stretched, expanded, and grow tremendously when I befriend Christ’s other friends. And frankly we think about the ills of society very differently. How foolish when we think we know what somebody else needs, or what would be good for them. They know. They have their own resources. What they need is precisely what we also need: friendships that leap over barriers and thereby change the world. I regularly say If you only hang around with people who are like you, you become ignorant and arrogant. More importantly, you miss out on the joy, and God’s church oozes away into irrelevance. Early Christianity thrived largely because it was such a quirky social experiment. Rich and poor, insiders and outcasts, Jew and Gentile, the rigidly pious and the questionably tawdry: all in church together, knowing their life rested in the mercy of God that dazzles us with fresh, creative, joyful relationships. Friends, church matters – especially when we get bold, have some fun with it, jump over a wall or two, and widen that social circle which, in God’s heart, is wide as our city, wide as the world.